Friday, we talked about how to create protagonists readers will love. James Scott Bell in his book Plot & Structure introduces what he calls the LOCK system (which he has generously given me permission to discuss). LEAD, OBJECTIVE, CONFLICT and KNOCKOUT. As storytellers, we must create a sympathetic, compelling lead if we want readers to engage. This is especially critical for longer works like novels or series. The longer the work, the more readers must love the protagonist, because they’ll be spending a lot of time together ;). Yet, an interesting protagonist is not enough. We have to have an actual story, which demands an interesting objective. Your protagonist must have ONE BIG ACTIVE GOAL. This past weekend, we watched an AWESOME movie, Haunter. From the movie log-line, I knew I was probably in for a really good story, and BOY I was right. The ghost of a teenager who died years ago reaches out to the land of the living in order to save someone from suffering her same fate. This was a really engaging story, and I’m being super careful not to ruin anything, but early on, we realize something is amiss our teenage protagonist’s household. The same day keeps repeating over and over and over and only she’s aware they’re trapped. But why? How? Very early her objective becomes clear. Save her family by saving another family and break their curse. Very simple objective, but loads of twists and turns. Really fab ghost story even for those a tad timid about horror, but it IS Halloween :D. This movie wasn’t gory, just a wonderful spooky mystery. Another interesting movie I watched recently is The Purge. This isn’t per se horror, rather a speculative thriller, but it does a great job of probing at our darker natures and asking What if? The objective is clear. In the future, a wealthy family is held hostage for harboring the target of a murderous syndicate during the Purge, a 12-hour period in which any and all crime is legalized. This movie questions the nature of morality and what it means to be human. Sure, this is supposedly a utopian future. Crime is almost non-existent, Unemployment is at 1%, and the economy is flourishing, but at what price? The protagonist makes a fortune selling security systems for people to survive The Purge—one night a year when all crime is legal. Hate your boss? Have a grudge against that guy who borrowed your weed-eater and never returned it? Well, apparently in the future, on my birthday, all murder is legal (yes, Hubby had great fun tormenting me about that). So feel free to hunt down your deadbeat ex with a machete. One night a year everyone has a Get Out of Jail FREE Card. Yet, funny how the protagonist’s tune changes (Yay, Purge!) when he and his family become the hunted (Hey, wait, The Purge might be morally wrong! GASP!). The protagonist’s objective is clear. When a wealthy many who supports The Purge (and makes boatloads of money off it) offers sanctuary to a homeless vet who’s been targeted for extermination, he’s forced to choose between his family’s safety or protecting a man he doesn’t even know against homicidal sociopaths. This is a super interesting movie, but if you’re a Texan, I warn you’ll spend most of your time critiquing poor tactics. Yet, as much as this family was apparently unaware of proper use of The Funnel of Death I still enjoyed it because it generated great discussion. It did what good stories should do. Make us THINK because it offered a warped yet interesting objective. All great stories have clear objectives. Yes, even literary pieces. Don’t believe me? Okay. Here’s a good example. I was going to go with The Road but after Haunter and The Purge I chose a lighter example and one that was both a movie AND a novel, because I can already hear…. Oh, but Kristen, those are movies. Novels are different. Um…yeah, but not really. I use movies as examples of storytelling because it saves time. But, here’s an example in the world of literary fiction that was made into a movie (that actually stuck very close to the book) to make you feel better that I am steering you down the correct path. The Joy Luck Club by Amy Tan could have been just a collection of tales about three generations of Chinese women, but they weren’t. There was an active goal to all of these stories. The mothers left China in hopes they could change the future for their daughters, and yet the old cycles, despite all their good intentions, repeat themselves and echo the same pain in the lives of their daughters. Actually the protagonist in the book is the collective—The Joy Luck Club. The stories propel the living members of the Joy Luck Club toward the active goal of finding courage to change the patterns of the past. The mothers seek forgiveness and the daughters struggle for freedom, but each is actively searching and eventually finds something tangible. In every story, each girl has a clear goal whether that is standing up to an abusive spouse and moving on or boarding a boat to China to meet missing sisters. Keep in mind that running away from something or avoiding something is a passive goal. Not good material for novels. Novels require active goals…even the literary folk ;). What are your thoughts? What movies or books REALLY made you think? I love stories that twist up my brain and beg for debate. What about you? To prove it and show my love, for the month of October, everyone who leaves a comment I will put your name in a hat. If you comment and link back to my blog on your blog, you get your name in the hat twice. What do you win? The unvarnished truth from yours truly. I will pick a winner once a month and it will be a critique of the first 20 pages of your novel, or your query letter, or your synopsis (5 pages or less). 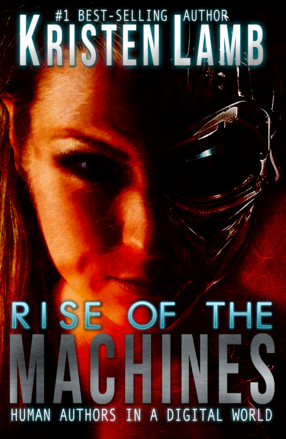 Also, for all your author brand and social media needs, I hope you will check out my new best-selling book Rise of the Machines—Human Authors in a Digital World. Sometimes when I need to see some opening hooks in a story, I watch four to five movies, just the first fifteen minutes. That’s how I see right away what sort of “grab and go” can really work. I think it’s a great exercise for a writer to visually see what a reader might see in your MS’s opening. This post really honed into the challenge of making your character’s through line clear and precise. Plus I think you can see what sort of lazy hook is used too often. Like in a horror movie where there’s a naked woman in the first five minutes or a graphic blood splatter before the first ten. Tension, suspense, and the build up of reader interest are as vital to a writer as they are to a screenwriter. Uhm… I have created a main protagonist – together with a family that should easily be recognized – and loved through an entire Trilogy… I wonder if my characters are “strong” and “intriguing” enough. In the book RULES OF CIVILITY by Amor Towles, I never could figure out what the protagonist’s goal was. Great sentence by sentence writing, but the MC just seemed to meander through her day-to-day life for a year as people she knew did despicable things. You say running away from danger is not a good plot for a novel, but your example of “The Joy Luck Club” involves running away from oppression or an abusive relationship. But they have to make ACTIVE decisions to 1) demand equal treatment in marriage/divorce 2) leave an abusive relationship for a kind man, etc. As a professional writer I need to learn how to create a character–I’m using myself as the character. I know myself well but don’t know how to put myself into words. How would I describe myself as the lone character in my book. How would I describe myself as intelligent without saying so? How would I describe myself as a cut above the rest without saying so? lol How would I describe my appearance? I only know how to write not what to write. I have no clue how you came about in my kingdom, but welcome to my realm. As a good writer who differs from everyone else by breaking all the rules, I still learn from good writers such as yourself too! You give excellent advice, your writing is influential which captivates, humors, entertains, informs, and teaches, all makings of excellent writing! Thanks for sharing your awesome self! I appreciate writing that makes me think or attributes to humor me. Another excellent post. I chuckled when you wrote the scenario of a writer explaining their book to an agent. I’m going to have to watch the Joy Luck Club again to get a refresher on each girl’s storyline. It is my mother’s favorite movie and we watched it together when I was younger, but the story didn’t resonate with my young mind at the time. I’ll watch it again to see clear examples of characters with strong objectives. Great post, as always. I had the pleasure of working with James Scott Bell in one of his workshops. Plus his books are great references. Thank you Kristen. This is a great post. Very clear explanation. I’m sending a link to someone I’ve been working with on her first chapter and I believe this will really help her. Helps me, too! Thanks! I love a book that challenges you to dig deep into a character and try to figure out what’s driving them and what message it is the author is trying to communicate through them. And when a book is set in a different culture or time period, there’s a unique kind of learning that can be experienced if the author has done his or her job. The kind of learning that leaves you amazed how so very different we all are and also how so very alike. I’m just finishing up The Heart is a Lonely Hunter and it is definitely one to twist up your brain and make you think. If anyone has any insights into The Heart is a Lonely Hunter, I’d love to hear them. I have to admit that I have been a bit surprised by the political views expressed, and yet in the end it still seems to be a book largely about the human need to belong and to be understood. Loved this, Kristen. In the beginning of this blog, you talked about ‘objective’ and going to conferences and listening to people try to tell someone about their book. This past weekend, I attended my writers group’s annual convention (James River Writers) and the last session on Sunday was something called Pitchapalooza. Authors had 60 seconds to pitch their book to a panel consisting of a couple known as the Book Doctors, (Arielle Eckstut and David Henry Sterry) and an agent/editor, Debroah Grosvenor. It was amazing how many authors made their pitch (in front of the entire conference attendees) and no one, panel or audience, had a clue what their book was about. Your comment on objectives above brought this to mind. I’m reformed (thanks to you). The objective for my protagonist was always there, but it wasn’t clearly defined early enough. I like mystery, but making her objective a mystery was confusing for the reader. Good post. I have to admit that, even though it’s something I’m aware of, I’m not always great at making the objective clear and getting it in early. I’m now reflecting on the story I’m working on and thinking that the objective needs to be much clearer much sooner. Because an unclear objective, or one that’s not introduced until late on, can be just the same as no objective for the reader. No, the antagonist becomes clear(er) at the Inciting Incident. The objective slowly will reveal itself and usually Turning Point Act Three is when the entire picture is laid out. THAT is when the protag decides to become a HERO or go home. For instance, in Haunter (which I SO recommend and don’t want to spoil), the protag’s OBJECTIVE is clear fairly early. Save herself and her family. But why are they trapped? How? Who? THAT is revealed over the course of the story, even if the objective is clear. Hmm… I think I’ve done a pretty good job with this, but I’m wondering about the same thing as moxeyns, my main characters objective forms itself as the story unfolds and about one third into the book.. it is very clear, before that, not so much, although… It doesn’t take much guessing from the reader’s part what it is, but now I’m wondering whether my approach serves its purpose. I love how your posts lately keep showing me how my book idea is a really good one, which reinforces what I have to focus on while I’m writing it. I have a great idea. Will my execution live up to it? That will be the question. Great post Kristen. Now I am going to go and try to figure out what my tag line would be to a prospective Agent…hmmm…lots to think about. I loved The Purge by the way! The Purge: Now that’s what I call an interesting premise! This is sound advice. Previously I’ve tended to do the panster thing and then retrospectively figure out what the objectives in the story are – which leads to major revisions of dialogue, storylines, themes, settings and character arcs (so… erm, everything really). For this year’s NaNo (under your guidance) I’m doing a lot more definition of objectives prior to the writing. Your blog is such a great resource, thank you! Huge thanks! I commented on your most recent post and then came back to this one. Could the Protagonists’s past be considered an Antagonist? No. It’s already happened, so we won’t care. There must be a clear and present problem/danger. I love it. You described something so natural every character should have. If it´s a movie, a book or even when we are talking about life. A goal. It´s so obvious and despite that many movies or novels lack those. Without it you simply can´t do it right. Perfect! Just found you via Twitter and am now following. Loved this post – the lady speaks sense. I started blogging to get back into writing. Now all I do is blog. Perhaps November is MY month!